MAC JU-65. 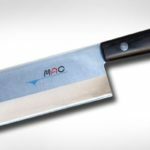 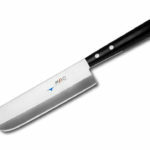 The thin, double-beveled edge of this Usuba is ideal for slicing and chopping most fruits and vegetables. 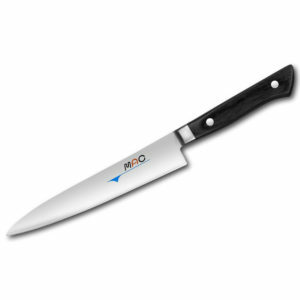 The straight edge allows the full length of the blade to come into contact with the cutting board without having to rock the knife. 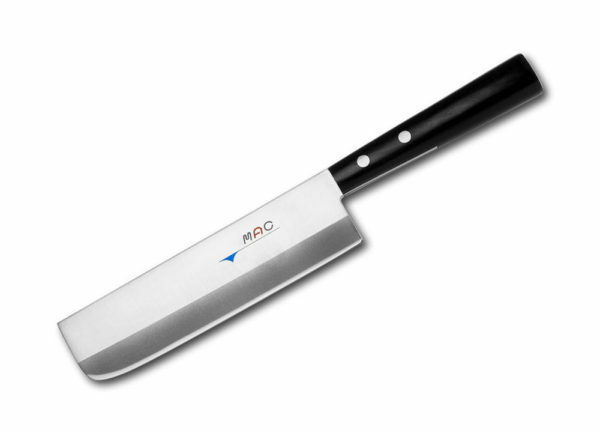 Typically used by Japanese chefs for performing Katsura-muki, a Japanese technique for creating thin sheets of a cylindrical vegetable such as diakon radish and cucumbers. 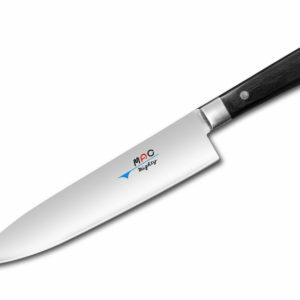 Contrary to its name, this knife can be used as a multi-purpose knife for meats and seafood as well. This knife should not be used as a heavy cleaver to chop through hard foods such as bones, frozen foods, etc.